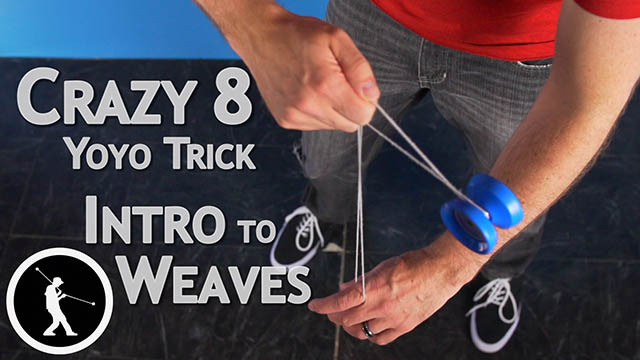 Learn the Figure 8 Yoyo Trick and Extended Figure 8. Figure 8 Yoyo TrickThis trick is called Figure 8 and we are also going to teach you a variation called Extended Figure 8 and they look like this. This one right here is Figure 8. Then to do extended Figure 8 what you are going to do is add an extra roll to the beginning and middle of the trick, so that looks like this, just like that. So Figure 8 is a weave trick, and it starts in a One-and-a-half mount, and unlike Crazy 8 where you hook this string coming in between your two index fingers you are not going to do that but what you are going to do is you are going to turn both of your fingers in and make sure that this string and this string here don’t fall off of those fingers when you turn in. 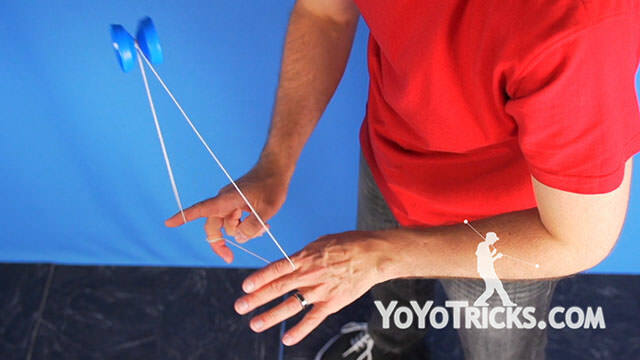 Once your hands are turned in, you are going to roll the yoyo toward you opposite hand around both of your hands, once to the inside and then once to the outside and you will extend your fingers again, and so that is just one Figure 8. This trick is a repeater, so as long as you are just doing one inside and one outside and you can continue doing the trick and it will always end back into a One-and-a-half mount. So when you are working on this trick at first, one thing you can keep in mind is that it is a little bit easier to manage the trick if you keep your hands really close together, that way you can focus more on making sure the strings are not going to fall off of your fingers and then as you get a little bit better at the trick you can keep your hands separate, which gives it a slightly nicer look. Now as you are practicing this trick, there is going to be a couple of problems that you will may run into, so I am going to address those right now. The first one is as you are practicing the trick, if you are not careful to weave around both hands on the inside and then again on the outside. If you just weave around your yoyo hand on the inside pass, then you may find after your second pass you have actually got a wrap around the bearing. That will start to kill your spin and it won’t allow you to really complete the trick. So again is the main thing that is happening right there is instead of passing around both hands on the inside, you can see the yoyo when I do it here, it is just going around one arm right here and that what causes that mistake to happen. So if you can pay attention to that, then that will help you solve that trick. 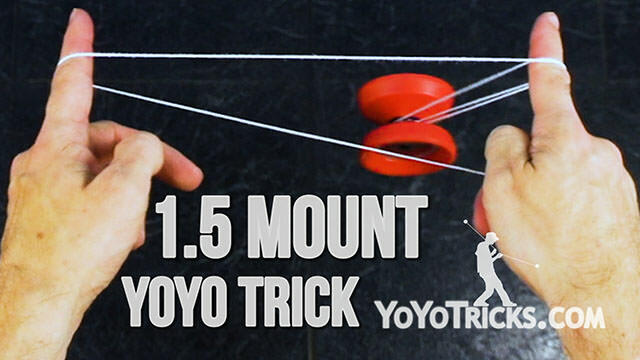 Now the second thing that can happen, is your yoyo may start to tilt a lot while you are doing this trick. So some of the tips that gave you in Crazy 8, will actually apply here as well. So what you can do is the same thing that we talked about, that as you are doing your weave you pick a point in space that is along, that is in line with the groove of the yoyo and you try to hit that point in space every time you do your weave. So when you are doing Figure 8, the point should probably be down here just below where your opposite hand is, you can see every time I do the trick, the yoyo passes through that point, and that helps keep everything on plane, and you can see the yoyo is hardly tilting at all, if at all. So that should be able to help you there. The third thing, that may happen with this trick is as you are doing the trick, especially when you keep your hands separated, the string may pop off the yoyo, so if you find the string rejecting, just like that. There is really two reasons why that may be happening. The first one is instead of keeping the yoyo really close to your hands on the inside and on the outside, you swing it just a little bit more to the inside or a little bit more to the outside and you can see that causes the string to pop off. The other thing that can happen is that you may be moving your opposite hand, a little bit too far forward or a little bit too far back. Same type of thing can happen, if your opposite hand is really far forward, then the string may pop off, and you will have the same problem. So kind of want to keep your hands really close together, really tight, you want to keep your yoyo orbiting them really close to your hands on the inside and on the outside and that will solve that problem. So once you have mastered Figure 8, there is actually an extended version that you can do that adds an extra roll on the inside and on the outside, so let me show you that, to do this trick all are going to do is you are are going to keep your yoyo hand extended, roll around the yoyo hand one time, and then when you curl in, you keep your finger extended and you undo that wrap. You can see that puts you in the same beginning position as Figure 8, then you can do just a regular Figure 8 and it will get you back to your One-and-a-half mount. So when you do it all at once, it just looks like that and you can see it adds an extra roll and it gives you a little bit more flair to the trick, so if you keep all of those tips in mind, in no time you will have Figure 8 mastered.